Yellow baboons are found on the savannah and in light forest in eastern Africa, from Kenya and Tanzania in the east to Zimbabwe and Botswana in the west. 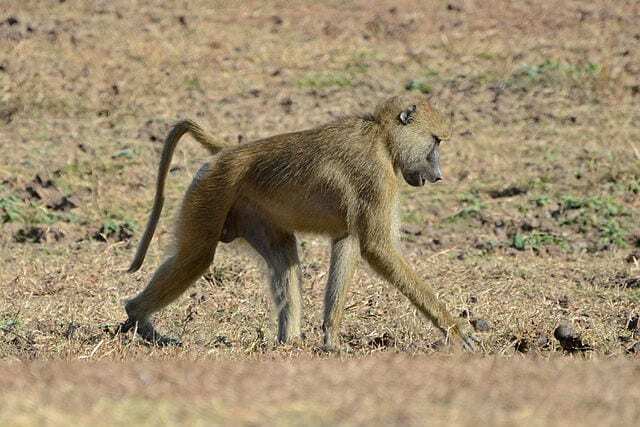 Like other species of baboon they are ground dwelling and have an omnivorous diet, prefering a diet of fruit and plants but also feeding on insects. These animals live in highly organised and strictly hierachical social group of as many as 200 individuals. 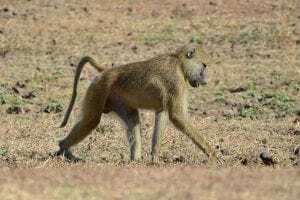 Primatologists studying the vocalisation of baboons have discovered that dominance relations of individuals in a troop can be determined by their vocal exchanges. Our yellow baboon skeleton is on display in the Museum but we also have, locked deep away in a sealed bag, the pelt of a yellow baboon. It’s a great (if ever so slightly creepy) specimen with it’s stuffed arms and legs. But did these two specimens come from the same individual? 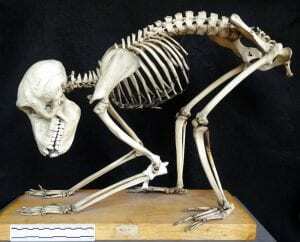 Well, upon investigation in our records I discovered a second pelt of a yellow baboon in our collection and even though we have just the one mounted yellow baboon skeleton we have skeletal remains of at least another three indviduals. So in total we have a collection of four yellow baboons. Tantilisingly, the second skin (not the one pictured) tells us that is the skin of one of the disarticulated skeletons off display and rather interestingly that the specimen was a gift from the UCL Institute of Neurology. 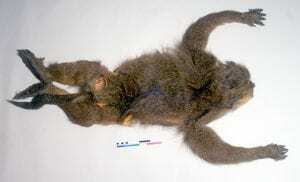 So, could the Museum have been gifted the other yellow baboon specimens from the Institute of Neurology? And what can these specimens tell us about the history of science here at the University? Our baboon material dates from at least 33 years ago and today UCL publishes facts and figures about the extent of its animal research. And what about in the wider museum world? How can we use our historical collections to engage visitors with this thorny topic? It was a subject that was picked up recently by a masters student here at UCL, who ran a facilitated display of the 1930’s dog respirator in the Museum to better understand visitor’s responses to animal research, a theme that is under-represented in displays on the history of science. You can read her thoughts here. I thought I would lighten the mood and end of some footage of baboons wading in water. Dean Veall is Learning and Access Officer at the Grant Museum of Zoology.